I installed a Zero Gravity sport touring windshield on my CBR 600 F3. I mistakenly ordered a dark smoke; I wanted a clear version. Installation was pretty easy - remove the mirrors, remove the old windshield (it was an aftermarket Targa) and place the new windshield between the fairing stays and the fairing. The windshield is a real wonder at highway speeds. Traveling at 70 mph is like riding at 35 mph with a normal height windshield. It's hard to believe that a couple of inches of height could make such a substantial difference. I'm still not sold on the dark smoke color, but I think I will keep it. This is a phenomenal product - heavy weight, optically sound, and very handsomely finished. pictures? Id love to check it out! Looks great on your Bike! Dark smoke and all... Looks natural. I am in serious debate about getting one of these, I just wish they came in red. I really like the way my red double bubble looks, and it's hard to give that up! On the flip side the more relaxed highway riding with the sport touring sounds amazing too! Thanks for the pics, it really does look good! I like it. The black screen with the red looks good, better than if you'd gotten the clear version. 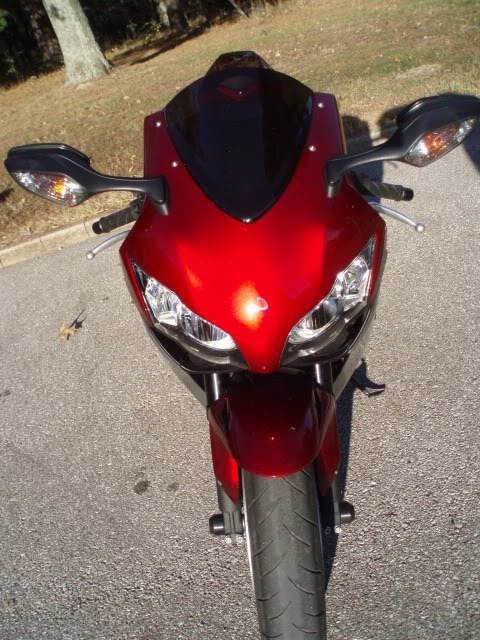 I have a dark smoke black screen on my bike with a candy apple red color.